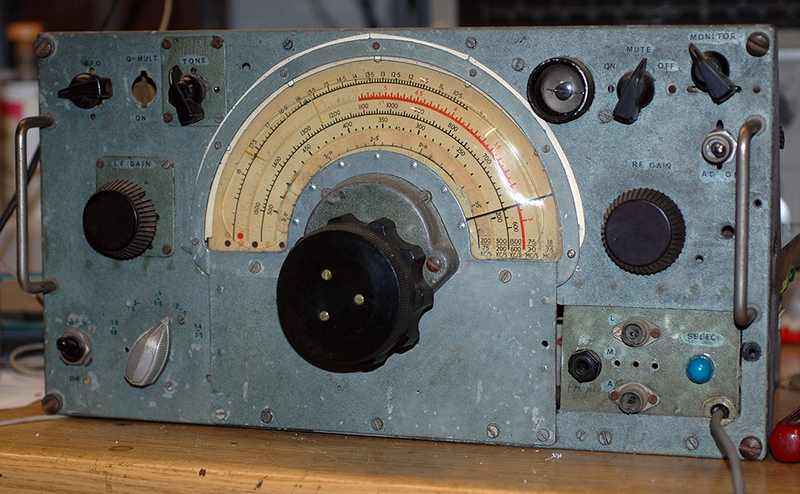 My first picture shows an example of arguably the most well known piece of radio equipment from WWII and has been extensively modified by a radio ham. The R1155 was used in most British military aircraft large enough to carry the weight of the 1154/1155 transmitter/receiver pair and also in some ships and ground installations. Although both of my examples have been modified for amateur use the upper example much more so as can be seen by comparing the two. This involves the addition of an integral mains power supply and various cosmetic type modifications such as covering the power and control "Jones Plugs" connectors at the bottom right with a blanking panel. Space inside the receiver for the extra parts needed for a mains power supply was often found by removing the integral direction finding circutry. The front panel is now fitted with different controls and original finish and markings removed, the latter replaced with newly engraved lettering. Sad to see..
To reduce the weight of the R1155 some models use aluminium instead of the standard outer steel case. Two tuning knobs were provided, one fast and one slow and you will notice that these two examples use different versions of tuning knobs. 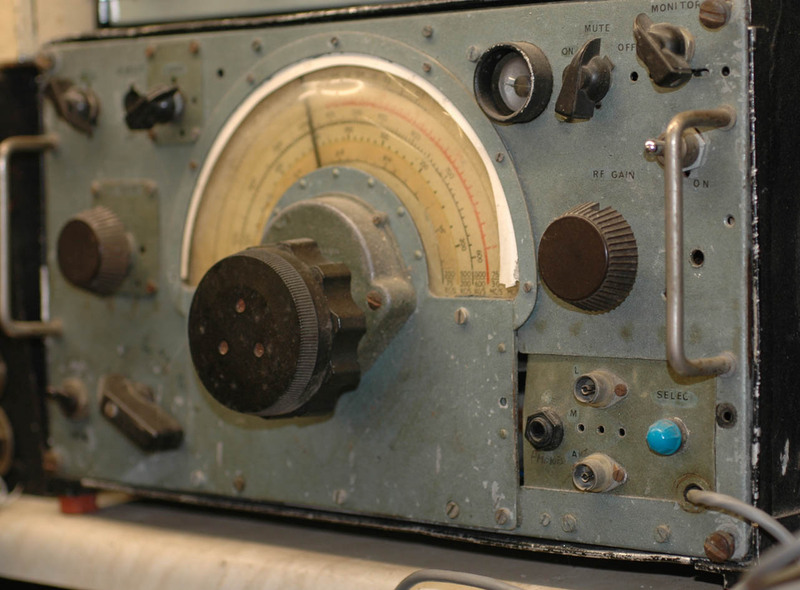 Below is a set with the early knobs which was later changed because the operator's gloved hand was prone to inadvertently turn the outer, coarse control when he was adjusting the inner slow motion knob. Much to my surprise, when I powered up the old set (it has a lead fitted with a modern 13 amp plug) and connected a loudspeaker and an aerial, the receiver worked extremely well. Thankfully, I hadn't stripped out parts for the earlier example which I refurbished ( see this lower down the page). As the perspex cover was very clouded I removed it and polished out blemishes. I also dealt with the white plastic padding strip which had shrunk (like the perspex cover) by something like 5mm in diameter. 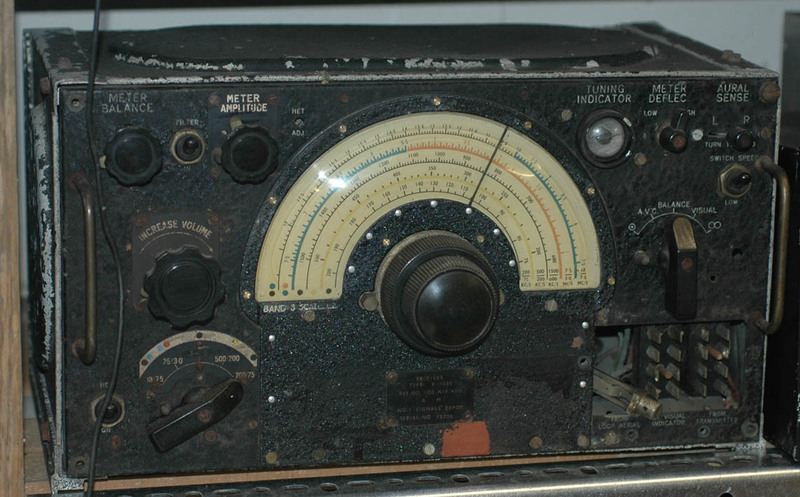 Once the cover had been removed I noticed the last owner had modified the receiver by substituting for the lowest range a new band covering 1.5 to 3.5 MHz (covering Top Band), gluing an inked strip over the original markings. In removing the dial I had to detach the tuning knobs. I found it quite tricky to re-attach the mechanism because of the way the output fitted the pointer/tuning condenser. There's a spring clip which needs to be pushed in the direction of the the pointer allowing a tiny indentation in a brass fitting to push aside the spring and latch the mechanism. If this isn't done properly the pointer may be forced out of alignment and foul the dial. I think I might tidy up the receiver, perhaps by making a new blanking panel, repainting the front and fitting better knobs. This particular example has been modified for ham use but when I removed a blanking panel the two original Jones Plugs were still in place although a headphone socket replaces a smaller original Jones Plug. The dial was in a very dirty condition but responded to careful cleaning. Rusty steel securing screws are (temporarily) replaced with brass 6BA screws. I removed a very distorted piece of unsightly, yellowing and much shrunken perspex used for padding the dial edges and replaced it with modern plastic. I polished the main perspex dial after using various solvents to remove yellowing and scratches.